The oil and gas industry is now required to report greenhouse gas releases from their facilities in accordance with 40 Code of Federal Regulations (CFR), Part 98, subpart W - Mandatory Greenhouse Gas Reporting. 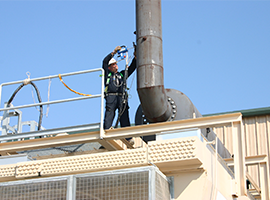 This includes emissions from vents, blow downs, pneumatically actuated valves, and other sites. CECO offers emissions testing services, an electronic packing vent monitor and emission-reducing packing to help you comply with these regulations.